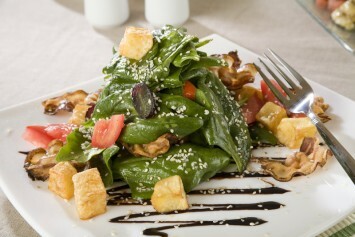 Fresh spinach salad recipes are wonderful at any time and so nutritious. You will find this particular bacon spinach salad recipe easy to prepare and just delicious. You wouldn’t think that a warm dressing would be appropriate for a salad, but spinach is a stronger tasting green and the warm dressing with the addition of bacon is a perfect match. Broil or fry bacon and drain well, rolling in paper towel. Crumble bacon into small pieces. Mix all ingredients for salad dressing, adding bacon drippings when they are still hot. Sprinkle bacon pieces over spinach. Drizzle with dressing while still warm for a warm spinach salad recipe that will delight. Make about 8 servings as a side salad, but this makes a delicious light meal as well. Serve it with our wonderful, light buttermilk biscuits on the side. Add 2 ounces of toasted slivered almonds for crunch and added taste. Thinly slivered red onions are pretty in the salad and add an extra bit of zing. This is a great low carb spinach salad recipe for those who are watching their carb count! That makes it a good diabetes diet recipe. Of course, omit the bacon and bacon drippings to make this salad even healthier. Have a look at our other fresh spinach salad recipes: Click here for a spinach strawberry salad recipe.